Finally the NBA preview series comes to a close. As with the “Island of Misfit Toys” preview, this preview is coming after the season has begun, but it’s a very young season, so it still seems appropriate. This final preview will be looking at the five teams who just might have what it takes to hoist the Larry O’Brien Trophy next June, and what needs to happen for that goal to be achieved. San Antonio was a big winner this offseason adding All-Star caliber pieces without sacrificing any of their core. 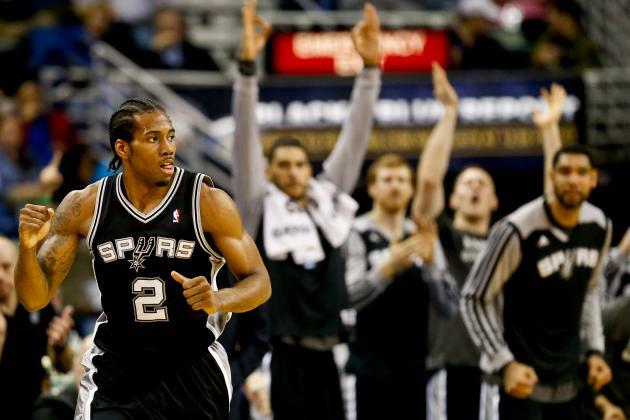 Kawhi Leonard, Danny Green and LaMarcus Aldridge are a nightmare trio for anybody on both ends of the floor. Plus, Tim Duncan and David West are actually zombies who forgot to lose their coordination and basketball I.Q. when they became “undead”. Manu Ginobili and Tony Parker are clearly fading, but still capable of a few vintage performances a year. Health is going to be the big thing that determines how far this team goes in the playoffs, that and figuring out how the new pieces fit into the offense, although the latter is a very minor concern comparatively. Call it luck if you want to, but Golden State was clearly the best team in the NBA for the duration of the 2014-2015 season. With the exception of David Lee, all of the key pieces return, which almost instantly makes Golden State the favorite to repeat. Steph Curry and Klay Thompson are probably the top backcourt in basketball right now, and Draymond Green is the defensive leader and soul of this basketball team. Oh, and then there’s Andre Iguodala who just so happened to be the Finals MVP despite not even starting all of the games in the Finals. This team has all of the pieces in place to make another title run, but as always health is the big variable. Kevin Durant and Russell Westbrook are back like a two-man tornado to just rip through the path of everything in their way. Billy Donovan replaces Scott Brooks as the head man, and so far looks to have installed a more sophisticated offense that runs plays other than “Westbrook smash” or “Durant score”. Enes Kanter and Serge Ibaka also give this team some nice scoring options down low, with Ibaka also having a nice mid-range game. One concern for this team going forward will be the fit for some of the role players beyond the key cogs of Westbrook, Durant, and to a lesser extent Ibaka. Kyle Singler looks like a weird hybrid between Draco Malfoy and Ivan Drago with his current haircut, and is off to a poor start shooting the basketball. Dion Waiters has some ability, but has to have the ball to really do anything with it, and if you think Russ and K.D. are giving the ball up for him then you are insane. As long as LeBron is here and still in his prime, then any team he plays for has to be considered a title contender right? He has been to five consecutive NBA Finals, which is impressive even if his all-time Finals record is one 2-4. Kyrie’s return sometime in December or January will be a huge boost, and Kevin Love’s fit in the offense looks much improved from last season. That core can definitely win a title and, unlike OKC, their role players both know their role and fit well within the scheme. David Blatt has come under much scrutiny for the way he handled this team last season, and his evolution as an NBA coach might end up being the difference between a title and another runner-up finish. Admittedly, this team was the biggest stretch on this list. “Da Bulls” would need to have nearly everything break their way to win the title, but that doesn’t mean it can’t be done. Cleveland getting upset somewhere along the way would really free up the East for Chicago. Derrick Rose doesn’t have to give the Bulls 82 regular season games, but if he can play enough to be both fresh and in game shape when the playoffs roll around it would be helpful. Jimmy Butler continues to emerge as Kawhi Leonard’s biggest threat to the arbitrary title of “best young two-way wingman”. Joakim Noah’s offense has fallen off of a cliff, but he is still a gifted passer for a big man, works hard, and is an emotional leader. Nikola Mirotic is off to a great start shooting the ball and so far looks like the “stretch four” option this team needed to open up its offense. Mirotic’s versatility and Fred Hoiberg’s new offensive approach are the two things that can give this team the offensive punch necessary to vie for a title.